The RTA Big Ride is an anual event that has been running since 1990, every year they cover about 600kms going through regional NSW over 9 days (Saturday to the following Sunday) with a rest day on Wednesday. This year (2003) the route was going from West Sydney (Warragamba) to Cootamundra. It was to cover at about 580km and the rest day was in Goulburn. I had looked at doing the ride the previous year, but I didn't get around to it. This year I looked at doing it, but I was going to attempt it on a Unicycle. I was riding a Coker Unicycle with a 36" wheel. The frame was built by a friend of my Fathers in Goulburn so I would be able to visit him and show him it as he had never seen the finished the product. I based the design on the Cokers that were used by the Unicyclist in EUT. Although I knew that the design I had wasn't perfect it was the best that I had and I didn't have the time to get it modified. So with very little training I set off. For those interested the frame is made from stainless steel tube, 26mm Outside Diameter, and 22.2mm Internal Diameter. It is currently using a Kris Holm Velo Saddle that I think is one of the best saddles on the market today. I was orgionally riding with 150mm cranks, but I was carrying 125mm if I felt like changing. It is fitted with a brake to assist in downhills but it is very touchy to use. These are some of my general comments on the Big Ride. Looking back on it, I don't believe that I was fully prepared to attempt it on Unicycle, I knew that it was going to be a lot harder than by bike, but I didn't expect that it was going to be that hard. Considering that I was ready to go home on Day 3 and call the whole thing quits I really enjoyed myself for the rest of the ride on 2 wheels. I think that this event can be done by Unicycle, but I am going to stick to 2 wheels when I go back next year. All in all, this is a very well organised event, there is something like 14 months planning for an event like this, so next years is already well and truely underway. For anyone who enjoys cycling, doesn't mind camping and likes meeting other like minded people the Big Ride is a good hit. Despite the fact that we cover nearly 600kms in 9 days, there aren't that many extreme cyclists doing it. Many pubs along the way were suprised at the drinking capacity of the riders. In previous years this ride has drunk pubs dry and I have heard of a pub that usually went through 4 kegs a week, in one night the Riders went through 67 kegs. The food is good and is enough to keep you fueled for the ride and the facilities are the best that can be organised for an event like this. For future rides I will do some more training, because I like riding as fast as I can, my legs were starting to feel the effects towards the end, despite the rest day. I will avoid Sun Burn early on as it can make sleeping more difficult. Towards the end there were a lot of solid tan lines on people from wearing cycling pants and I have a great set of Panda eyes from wearing sunglasses. From this ride, I would like to thank. My Parents for giving me a proper bed for the Rest Day. Pegusas Support Crew, these guys helped me out until I could get two wheels either by letting me borrow a bike or help me get a tandem partner. They would work late into the night every day to get through the back log of work on broken bikes. All of the volunteers. Without these fantastic people this ride would cost a lot more, or not happen at all. 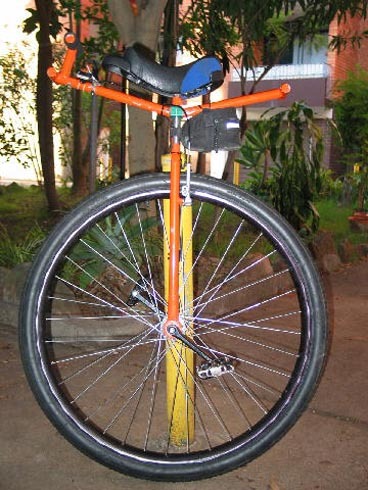 Most of all, everyone who belived that I could do this on the Unicycle. I don't feel that I failed. I covered over 100kms of this ride on one wheel and all of the other riders were still amazed that I covered that far. To anyone reading this who did this years ride, I will see you next year, but on two wheels.